Background: Systematic reviews alone are often not sufficient to inform treatment decisions and guideline development as the evidence needs to be contextualised and patient values and preferences need to be considered. Quantitative benefit-harm assessments (BHA) have become more common to address this gap. BHA methods are commonly based on aggregated data which have several limitations. For example, most existing methods do not explicitly consider that benefit and harm events are not independent within individuals and that the benefit-harm balance may change over time. Objectives: Our aim was to develop a novel method for determining the benefit-harm balance over time based on individual patient data, using SPRINT, a randomised clinical trial that compared systolic blood pressure (BP) targets of 140 to 120 mmHg, as an example. Methods: We developed a model of health utility over time to assess benefits and harms on a common scale. In collaboration with patient and caregiver-focus groups, we determined clinically relevant outcomes for inclusion in the analysis. The model is a step function on a scale of 0 (death) to 100 (perfect health), where the utility drops when an event occurs and may return to the previous level if there is recovery. We set the baseline-utility value for each patient according to age, gender and baseline renal function. We defined drops in utility due to an event with empirical disability weights. Results: Figure 1A shows that mean health utility decreased from 89.8 in both groups [95% CI 89.5 to 90.0] by 4.4 [95% CI 4.1 to 4.7] units in the intensive BP control group and by 5.4 [95% CI 5.0 to 5.7] in the standard BP control group. Over 4 years, the 95% confidence interval of the difference in mean health utility (Figure 1B, grey area) is always within ± the minimal important difference of 3.80. Thus the two BP strategies were clinically equivalent at a significance level of ≈2.5%. 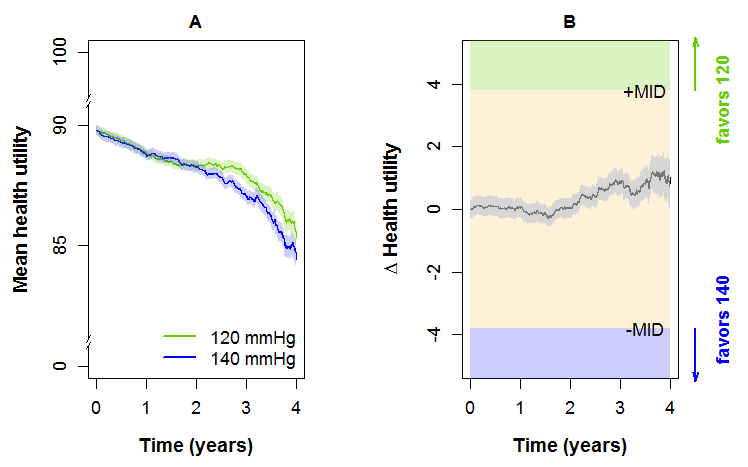 Conclusions: This novel method for BHA over time based on individual patient data showed that taking into account not only the benefits, but also the harms of a lower BP target, the two BP targets yield clinically equivalent outcomes over 4 years.